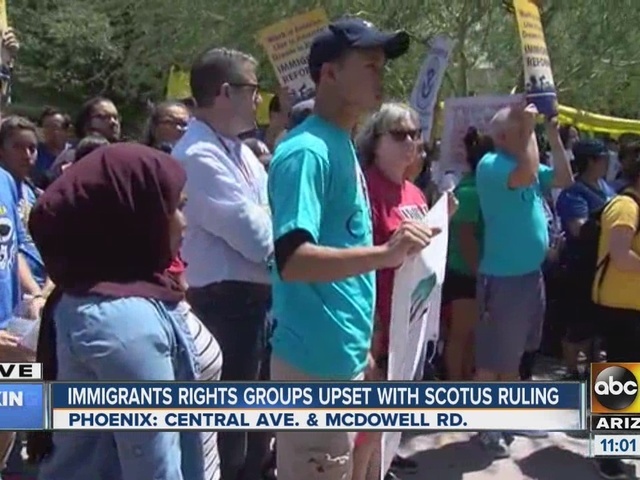 Protesters gathered outside the U.S. Immigration and Customs Enforcement building in Phoenix to voice their dismay at a Supreme Court decision blocking President Barack Obama's plan to shield millions living in the U.S. illegally from deportation. More than 60 activists blocked parts of Central Avenue, a major thoroughfare, just north of downtown just before noon. They were carrying signs in sweltering heat and chanting in Spanish and English. About two dozen more stood on the sidewalk in the shade. Phoenix police officers were monitoring the scene. Helicopter video showed two women and two men apparently being arrested after refusing to leave the street. The action came hours after the nation's high court deadlocked on an Obama administration appeal of a lower court decision that blocks his 2014 plan. Texas led Arizona and other Republican-dominated states in challenging the Obama program.